Within the ultra cool world of Absolute Bangla Suites you will find yourself at the heart of the action of Patongs most vibrant street Soi Bangla, yet just two minutes from the beach. Inside, we've captured the electrifying with modern and exciting finishings, quirky lighting design and music systems. 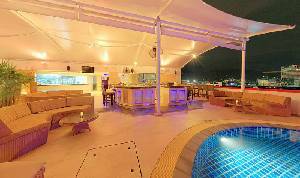 Up on the roof sits Climax, one of Phukets most fashionable hang outs, offering poolside dining, a buzzing music lounge and a unique birds-eye view of the town that never sleeps. It's all cool, chic and very, very sophisticated. And yet all wrapped up in a package that's luxurious, exclusive and curiously elegant. How can you resist? Absolute Twin Sands is a luxury resort from the award winning development team at Absolute World Group and offered for sale through world leading agents Jones Lang LaSalle and the Group's dedicated Real Estate and Fractional Ownership teams. Nestled between two white sand beaches, set within a spectacular peninsula, boasting remarkable views and soon to be neighboring the 6-star Rosewood Resort, Absolute Twin Sands Resort & Spa, on Phuket's south west coast, is the ultimate resort getaway for those looking to holiday in a more secluded corner of Phuket, yet with easy access to the hustle and bustle of Patong. 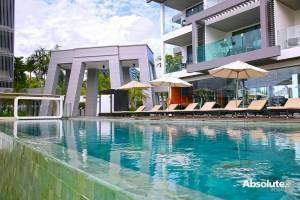 Owners and guests alike have now been enjoying this luxury Thailand hotels facilities since the first phase of the resort opened in 2013. Both Phases I and II have been sold out off plan and are now enjoyed by Owners, Guests and their families alike, delivering great value, affordable luxury, a highly desirable location and an unforgettable holiday.